Wonderglow has multiple uses—it's perfect for an easy glow on the go. 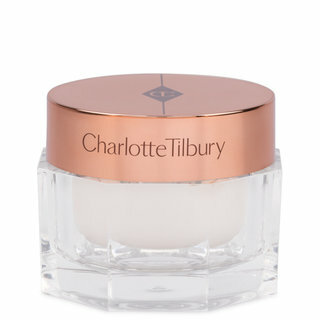 For a dewy, no-makeup look, start by moisturizing with Charlotte's Magic Cream. 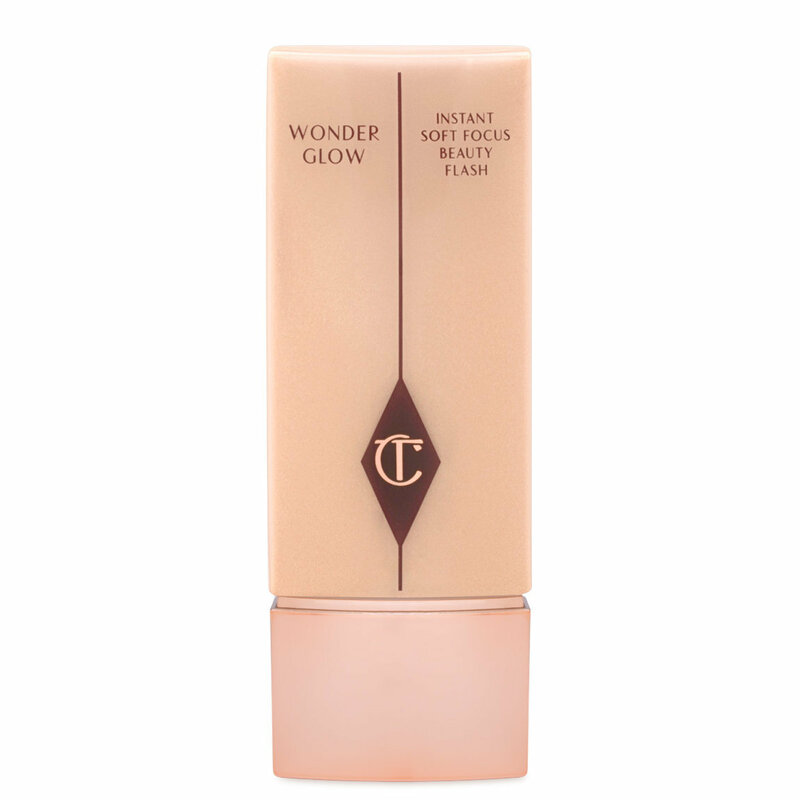 Apply Wonderglow with clean fingers or a brush, focusing on the top of the cheekbones for an instant lift. 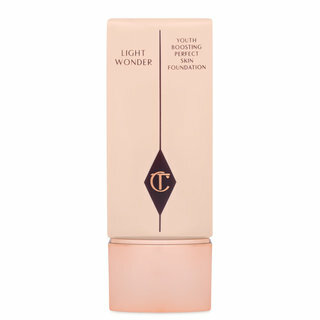 To use as a luminous primer under makeup, apply a fine layer of Wonderglow to the entire face before applying makeup. Wonderglow can also be used as an instant pick-me-up after a day at the office: Just smooth a dab over cheekbones and brow bones on top of makeup to lift and perk up your complexion. To start I am 48 and take extremely meticulous good care of skin and I do not skim on anything that touches it. I follow all the rules; sunscreen, retinol, vit. C, fragrance free, exfoliate etc. I was extremely excited to hear that CT was finally being introduced to the USA via Beautylish (who I love) and that have ways to allow you to afford these higher end products ( Thank you). For a year I followed this particular line that is commonly used in the UK and through Wayne Goss reviews- I couldn't wait to try them- I figured I would start with the Wonderglow. To start, it is light, non greasy, feels airy and soothing on the skin ( to my surprise), dries quickly and is easy to work with but....and this "but" is a big one...upon close up inspection I noticed this lotion has glitter sprinkles! Glitter sprinkles!! I am truly disappointed as glitter is not something that should be on olde skin- with that said, if I wear it under foundation you can't see the glitter and it does seem to give a slight sheen- don't know about the luminosity part as the foundation I use already provides a soft natural glow- with this under it does give it particular look almost like a candlelight look-quite beautiful actually ( glad I tried it this way and did not just returned it like my 1st instinct was to do just that at the price it costs) now I don't know about the longevity of this glow and how it holds out during the day- I don't think its a powerhouse in that area. I would not by any means or recommend this product be used on its own or over foundation as anyone looking at you at close range will see you light up like a disco ball, but under foundation or with some subtle powder foundation it works. I do love the way it feels once on, the anti-aging peptides and hyaluronic acids get soaked right in immediately leaving no greasy over the skin feel at all. No sticky feeling either- because your skin drinks it up, for that reason and that reason only- I will keep this highlighter/Wonderglow lotion. Still I am torn at the fact that it shows glitter specs and feel it should had been totally fragrance free- as anything containing fragrance will overtime breakdown the collagen making properties of the skin. It is not overpowering it seems to be a natural scent probably from the ingredients in it. It also does have excellent ingredients that do benefit the skin and the formula is spot on as most of this type tend to lay on your skin, feel greasy, and heavy. Well, I hope this helps someone. I must say that all skin is different and this just might look and work totally different on nice firm young skin VS the older, lined and starting -to- lose -elasticity skin. All in all do I think it was worth such a high Price-No. Will I try another CT product- most likely. Yes- I probably would. Dying to see how the foundation turns out. Good luck, girls. I hope it is the miracle fix to you all- for me , it is just a good lotion. Pretty, but it highlights pores. I'm going to have to agree with Elba's review, I'm afraid. I was really excited to try this product initially, and when I was paring down my list of what to try last year when I ordered from the UK, this was a must-try. I was so disappointed by the fact that it contained shimmer. 'Illuminating' products do sometimes contain shimmer, but because of the description I just wasn't expecting that here. Even under foundation, I felt like it made the larger pores on some areas of my face look more obvious, so now I only use it as a highlighter on the 'safe' areas. Beautiful primer for glowing skin! Ok, so I almost didn't buy this product. I read the reviews and was terrified of the feedback of this primer being "glittery" and highlighting pores. After all, I'm almost 49 and frankly don't have perfect skin...yes, I have pores, fine lines, and adult acne (sheesh!) I certainly don't need a product that's going to bring out the flaws in my skin. 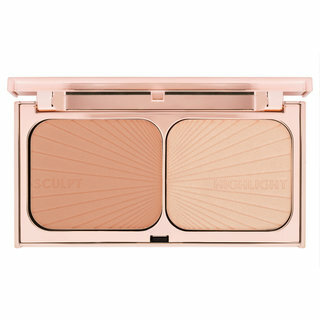 But since I was already using, and happy with, the Tilbury Light Wonder and Air Brush Flawless Finish powder, I thought I should give this a go to. The Wonderglow is in a package exactly like the foundation. On the one hand this is good since the product is easy to hold and dispense just the perfect amount. (A little goes a long way with this primer so a drop or two is all you need for full face application.) The drawback is that they look very similar in the vanity! 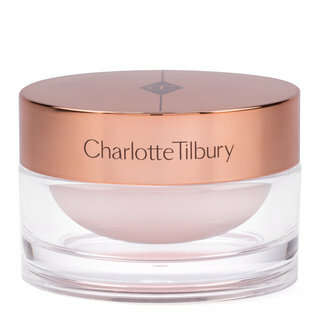 The primer is said to have three uses: for a dewy glow alone, as a makeup primer, or as a highlighter (on top of makeup). Since I have only used this product as a primer under makeup, my review will only cover the single use. Before I go any further, let me clear something up - this product does NOT contain glitter. The product is illuminating and has a slightly warm sheen. Upon dispensing, it may seem to appear overly shimmery, however, on full face application, the shimmer lessens to a diffuse glow. The product is slightly moisturizing. I have normal skin and used a moisturizer prior to applying this product. I was a little concerned about the rose hip and camellia oils in the product (added to restructure, retexturize and moisturize the skin) but they did not make my skin greasy, oily, or shiny. Additionally, the oils did not add any fragrance to the product. 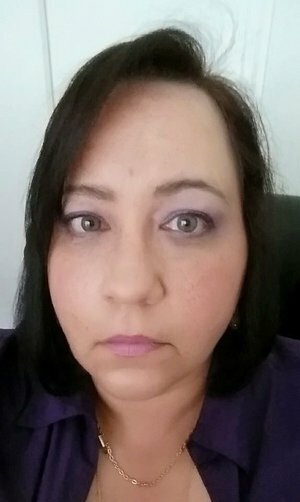 The Wonderglow primer wore perfectly for me about 10 hours (until I removed my makeup). The picture attached was taken after having my full face makeup on for 7 hours. (This includes the Wonderglow, Light Wonder foundation - 4, Air Brush Flawless Finish powder - fair, and By Terry concealer - 3.) Again, my mea culpa since I am a lousy photographer - the pic was taken with a cellphone and no filter or special lighting was used. Wonderglow made my skin appear glowing, youthful, and healthy. It did not accentuate any of my skin flaws but instead the light-diffusers in the product actually camouflaged them. I highly recommend this product. I have to say, I haven't seen a lot of African American women reviewing CT, especially with my skin tone, so I was excited to try this product and see if I could achieve something close to the women in the CT tutorial. I think that WONDER GLOW IS VERY GOOD, I'm 42 almost 43 yrs old, I don't mind time marching on, I just don't want it marching over my face!lol I take great care of my skin, drink only water and stay out of the sun, plus use a sunscreen, but still find that, the luminosity that my skin had even 10 yrs ago, it not the same. In the photo attached, I'm wearing all CT facial and lip products, I think that paired together (even before I put the FILMSTAR ON, which I LOVE) the overall affect is a soft lit from within glow. I didn't see any obvious glittery glow (my skin is dry, but I did use MAGIC CREAM underneath) as stated in another review, just a nice soft finish. This is a miracle worker!! It instantly turns around my skin especially when I don't get enough sleep or I have had one drink too many the night before. I like to mix it in with my moisturiser and apply it all over. 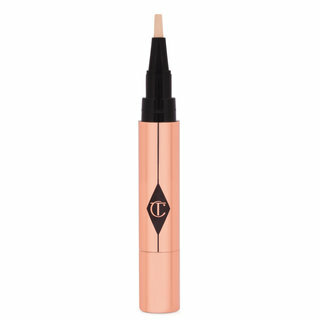 For a more subtle effect I dab a touch of it onto my cheekbones to liven up my complexion. This product truly makes my skin look like I have a "soft focus" filter! I was pleasantly surprised as most products claim that yet never actually give me the affect. I can't understand how some other reviewers saw glitter?!? I have NEVER noticed that or came close to thinking glitter was involved here. This feels very similar to the smash box primer in texture and application, it's smooth yet almost so light you're unsure if u got enough on. I've applied this under and on top of foundation and I love both ways. Seriously you have to try this it's amazing! I've tried everything out there and this is the best! I cant imagine living without this! It just gives that extra "wow you're skin looks amazing" look and everyone will tell u that. Try it now! I have been using this by adding 1/4 of wonderglow to 3/4 of my CT foundation, and I love the results. I have not yet tried it as an actual primer, but since I am happy with my current results, I probably won't bother changing my routine. It gives me a subtle glow (NOT shiny or shimmery) and the texture is great. Not too runny, not too thick. I believe it will also last me ages as I use so little to mix with my foundation. Great product! It gives that a natural and wonderful glow on your skin as the name of the product. I have oily skin but my skin does not oily with this product on my skin. It just gives a shine but not any oily finish. I love it and I'm using it everyday of my makeup. It looks beautiful on the camera. Smells nice and has a very subtle glow. I usually mix this with my moisturizer and then apply. I've used it alone before too and it is very pretty. Reminds me of a fancy version of MAC lustre drops. Not sure that I would purchase again but I am happy I have it and will definitely keep using it til it's gone.